The Chinese Government recently passed new measures on domain-name registration in an attempt at fixing regulatory problems plaguing the system. While it has fixed some internet issues others still remain. In this article, Ailin Zhou, intellectual property assistant at Taylor Wessing, shines a light on the history of the Chinese domain-name industry and the impact recent developments have made on the Internet in China. The Order of the Ministry of Information Industry of the People’s Republic of China, also known as the revised Measures for the Administration of Internet Domain Names of China (Revised Measures), was released by the Ministry of Industry and Information Technology of the People’s Republic of China (MIIT) on 24th August 2017 and went into effect on 1st November 2017. The Revised Measures, according to the MIIT, are meant to standardise the administration and registration of Chinese internet domain names. This echoes the goal outlined in China’s 13th Five-Year Plan, which is for the Chinese Internet to develop in a healthy and sustainable manner. Prior to 1998 In 1997, the first version of the Revised Measures was issued and the China Internet Network Information Centre (CNNIC) was established. At that time, the domain-name industry in China consisted of the administration, the domain name registry and the domain name registrar. Statistically speaking, there was a huge increase in the total number of domain name registrations during this period. Using the suffix ‘.cn’ in domain names increased from 18,396 in 1998 to 122,099 by 2000. In 2002, the CNNIC Domain Name Dispute Resolution Policy and the CNNIC Rules for Implementation of Domain Name Registration were issued. This was a remarkable achievement, as the aforementioned policy and rules simplified the process for registering a domain name. At the end of 2008, the total number of domain names with the suffix .cn exceeded 13,500,000. There was an adjustment phase from 2009 to 2011, after the Chinese Government adopted a real-name registration system. Thanks to the use of new, generic top-level domains (gTLDs), the industry continues to expand the number of new domain names in use. According to the 39th Statistical Report on Internet Development in China, by December 2016, the total number of domain names used in China had increased to 42.28 million, up 36.3 per cent annually. Additionally, that same year the number of .cn domain names reached 20.61 million, an increase of 25.9 per cent. This increase accounted for 48.7 per cent of all domain names in China, while ‘.com’ domain names totalled 14.35 million and made up only 33.9 per cent. Although the statistics on domain name registrations have not yet been released by the CNNIC, it is anticipated that the number of names being registered will continue to rapidly increase. Due to the rapidity of its growth, the industry needs to be appropriately regulated. 1. Clarified duties for MIIT and provincial level communications administrations. Domain name registries and domain name registrars are supervised by MIIT. A provincial-level communications administration is entitled to administer domain names and authorise local domain name registrars. There are no regulations which govern the entire region. In other words, local communications administrations and MIIT are now consistent with how they enforce domain name registration. 2. Newly standardised domain name registrars. • Removal of the requirement that root server operators and domain name registries/registrars must be legal entities established in China. • Removal of the requirement that registrars must have capital of no less than renminbi-yuan (CNY) 1 million. • Additionally, one applying to be an MIIT-approved registrar must have a good credit record and the ability to safeguard the registrant’s personal information. According to the Revised Measures, there is no need to immediately transfer the domain to a Chinese registrar selected by MIIT if one’s current internet content provider (ICP) licence or ICP filing is valid. 3. Advanced institutionalisation of domain name registration services. More detailed regulations were outlined in Chapter 3 of the Revised Measures. This was so the domain name registrars could ensure that domain names were acquired properly. Compared to the Old Measures, the Revised Measures emphasised the following four points. 1. The domain name reserved list shall be revised. 2. Domain names acquired by fraud, duress or any other improper means shall be void. 3. It is illegal that one maliciously directs its domain name to another person’s internet protocol (IP) address. 4. 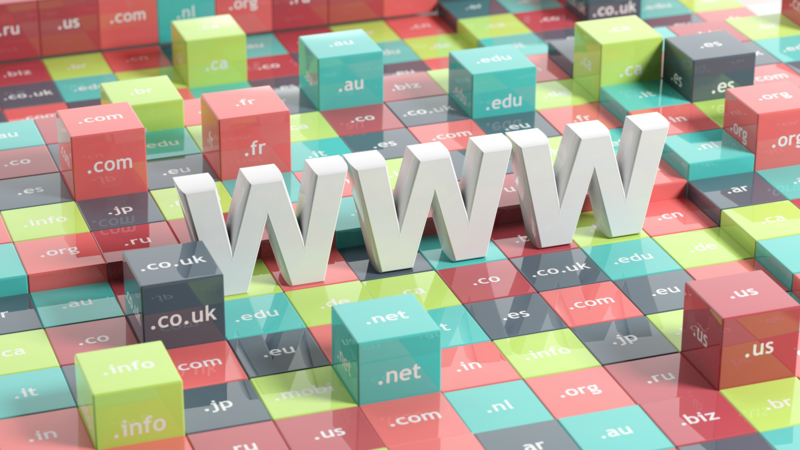 Providers of internet information services must not use domain names for unlawful activities. Domain name registrars are required to take action against unlawfully used domain names, by either cancelling or disabling them. 4. Enhanced protection for the registrant’s information. Since some registrants that try and acquire a domain name by improper means or for improper purposes tend to use incorrect personal information when registering, the Revised Measures emphasise that the registrant should submit accurate and complete information. Additionally, the Revised Measures require strict scrutiny when it comes to evaluating applications for registering domain names. The Revised Measures also attach more importance to data protection than the old registration policy did. 5. Enhanced supervision of the domain name registrars. Registrars will now be supervised on a regular basis. However, the Revised Measures do not explain what is meant by “regular basis”. Despite the vagueness on this issue, it is reasonable to expect that there will be a certain period of time set aside for the local communications administration to supervise the domain name registrars. • Can domains still be resolved in the Chinese mainland if existing domains are hosted outside China? 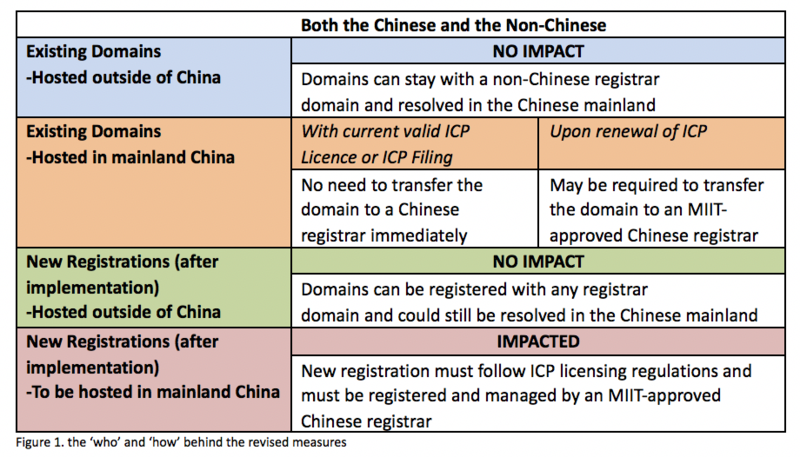 • Can domains be resolved in the Chinese mainland after the Revised Measures are implemented if the newly registered domains are hosted outside China? • Is it necessary for existing domains to transfer to a Chinese registrar with the relevant permit? • What are the things new registrants need to pay attention to if their domains are to be hosted on the Chinese mainland? For now, it seems that websites hosted on foreign servers will not be affected by the Revised Measures. 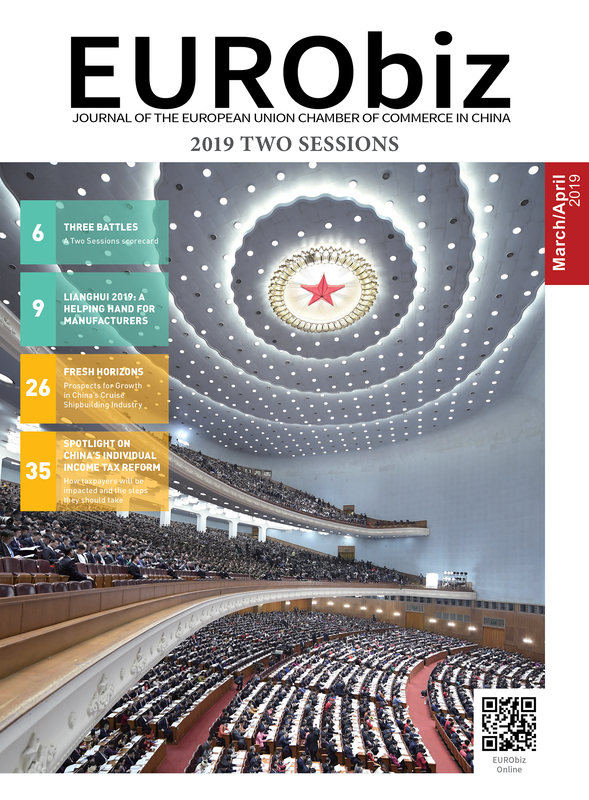 However, it is anticipated that relevant Chinese Government authorities could modify a number of other regulations when implementing the Revised Measures. The Measures for the Administration of Internet Domain Names of China, Ministry of Industry and Information Technology of the People’s Republic of China, 2017, viewed 1st December 2017, < http://www.miit.gov.cn/n1146285/n1146352/n3054355/n3057254/n3057264/ c5778555/content.html >, (in Chinese). Xu, Y.W., & Su, Y., 2017, History of Chinese Domain Name Industry. Journal of The Internet Economy, vol. Z2, pp. 90-97. Opinions of MIIT on The Measures for the Administration of Internet Domain Names of China, 2017, viewed 1st December 2017, < http://www.miit.gov.cn/newweb/n1146295/ n1652858/n1653018/c5778697/content.html >, (in Chinese). Taylor Wessing is a leading full-service law firm with over 1,200 lawyers in 33 offices around the world. Their China Group members are based in Shanghai, Beijing, Hong Kong, Munich, Frankfurt, Düsseldorf, Hamburg, Vienna, Paris, London and Singapore. Besides all areas of business law relevant to business transactions in China, they are also well known for their advice to Chinese companies investing overseas. For more information, please visit their website. Share the post "Internet Registration Rules in China"
browsing this web site dailly and get good data from here all the time. I’ve distributed your web site in my social networks!